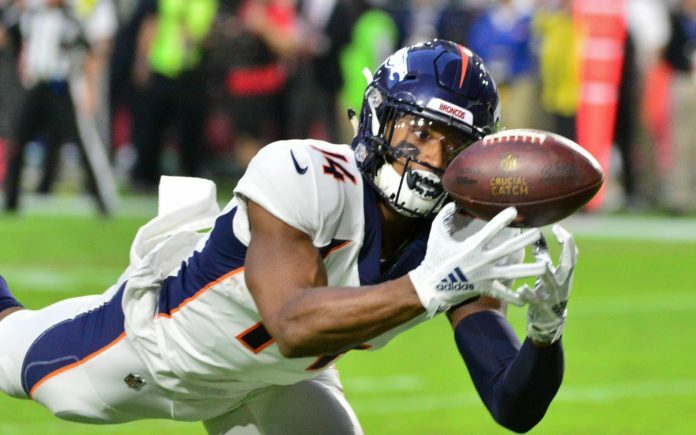 Courtland Sutton catches a TD from Emmanuel Sanders. Credit: Mark Kartozian, USA TODAY Sports. In recent years, having Denver Broncos on your fantasy football team hasn’t been a great move. But, this year, there are multiple Broncos players worth owning on your team, and now, there are three that are basically must-starts if you own them. Sanders is enjoying his second-best season in his fifth with the team. His 660 receiving yards and three touchdowns each lead the Broncos, and his receiving yards are No. 11 in the NFL. Sanders has always possessed reliable hands and new quarterback Case Keenum has quickly developed chemistry with the veteran star. “The showman” currently has 11 plays of 20-plus yards, regularly exploiting defenses with the big play in the vertical passing game. Sanders is a must-start, even before the trade of Demaryius Thomas. Now, with Thomas gone, Sanders will earn even more targets and has moved into the top-10 for wide receivers according to CBSSports. Lindsay is the rookie sensation, currently up for Pepsi Rookie of the Week for a second time this year. His 531 yards alone are enough to possess him on your team, and start him every week. Those 531 yards are No. 1 among rookie running backs and No. 6 among all running backs in the NFL. Lindsay is electric, able to shift gears and change direction in an incredible fashion. He’s a UFO, every other running back is an earthbound plane. Not only is he a dynamic running back, electric in his style while rushing for three touchdowns, he can also catch the ball out of the backfield. Lindsay has 18 receptions for 136 yards and one score through the air, too. And, with Royce Freeman injured last week, he went from “flex” back to definite starter. If Freeman again can’t go this week due to an ankle injury, you’ve got to start Lindsay against the Texans. Sutton, a rookie like Lindsay, was already getting about as many snaps as Demaryius Thomas, but you can expect his targets to increase now that D.T. is with the Houston Texans. While he’s yet to hit the century mark in receiving yards, Sutton’s two touchdowns on the season have come over the last four weeks. And his 182 receiving yards over that span are more than his first four games. Simply, he’s finding his groove on the field, as that spectacular catch down the left sideline against Kansas City proved. Sutton’s 17 receptions aren’t a huge number, but his 19.1 yards per reception show he’s a true big-play threat, ranking No. 3 in the NFL in that category. While Sutton had been a “flex” option to this point, he’s now a solid flex play and could even become a decent WR2 option some weeks. Denver (3-5) hosts the Houston Texans (5-3) and Thomas this Sunday at 2 p.m. MT.